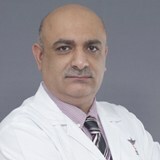 Dr. Auday completed his M.B.C.H.B from College of Medicine, Baghdad University in 1994. He started his career as a doctor in Baghdad teaching hospital in the department of medicine and was a part of the emergency department. Later on he joined the Gynecological and Obstetrics Department and was an assistant in surgical procedures. He has pursued courses in respiratory care unit (RCU) and intensive care unit (ICU) and coronary care unit (CCU). He was also involved in community health and worked as doctor – inspector in the Ministry of Health. He is a member of Iraqi Medical Association, Iraqi Red Crescent Society, Alalwaya Social Club. Dr. Auday is well versed in English and Arabic.